The luxurious villas of the Le Duc Hillside estate are located atop a hill, next to the beautiful beach of the Cote d'Or on Praslin. Spend your holiday in style and comfort, surrounded by breathtaking scenery, and right next to one of the island's best beaches. In the north-east of Praslin on the Cote d'Or beach. Two luxurious villas of different sizes. Breakfast included, half board available (three bars and restaurants). Villas with satellite TV, free WiFi, iPod docking station, air-conditioning, private veranda, magna pool, three restaurants and spa at the neighbouring hotel. Price includes the use of a rental car or minibus for the duration of your stay. Le Duc Hillside belongs to the neighbouring Le Duc de Praslin hotel, and is located up a hill behind of one of Praslin's most beautiful beaches, the Cote d'Or. The view from the villas is truly incredible, allowing you to admire the whole bay and the ocean as it stretches out in front of you. Thanks to the elevated location, this view is almost unparalleled on the island. Spend your holiday in style and comfort, surrounded by breathtaking scenery, and right next to one of Praslin's best beaches. At midday, why not stop by the Café des Arts for a small snack? Le Dauphin restaurant then makes the perfect end to the day, serving up traditional Creole dishes and international delicacies. Both restaurants offer lunch and dinner options, with Café des Arts serving up fine-dining seafood, while Le Dauphin offers Creole fusion cuisine, with scrumptious buffets and set menus on alternate days. Café des Arts is well-known across the island, and is one of Praslin's best eating spots, so guests won't be disappointed by what's on offer. Be sure also not to miss out on the Chill Out tapas lounge bar, which offers a more relaxed option, serving fine tapas, cocktails, a selection of beers, and Spanish wines. Chill Out is also Praslin's number one entertainment spot, open till late at night, and the only place where you can eat until 2am over the weekend and 1am during the week. Another high point of the hotel is its spa area, located right next to the hillside estate. The hotel also offers three bars: Charcoal Bar located at Le Dauphin, Blue Octopus located at Café des Arts, and the Chill Out Tapas Lounge Bar. Located up a hill beside the Cote d'Or beach. The neighbouring hotel, Le Duc de Praslin, is located further down, closer to the Cote d'Or beach, and offers three restaurants and bars, a pool, and a spa area. Don't forget to try the Café des Arts, which is one of the best restaurants on the island. Start your evening off with a delicious cocktail at the tapas bar. The hotel will be happy to organise boat trips and island excursions for guests, as well as non-motorised watersports equipment. The pizzaria of the Barjaya Praslin Beach Hotel is located right on the ocean with a beautiful view of the Cote d'Or and the offshore island of Chauve Souris. Non-guests of the hotel are also welcome to come here to enjoy the delicious Italian food, as well as some Creole specialties. This open restaurant, located in a lush orchid garden with its own fish pond, benefits from a really romantic atmosphere. The restaurant offers the best of the best of Creole cuisine, including fish carpaccio, a choice of different curries with coconut milk and cinnamon, or a variety of different fruity cocktails. These delicacise can also be enjoyed at the pool by candlelight. Here, guests can enjoy delicious cocktails, fresh fish dishes, tropical fruits, and an excellent view of the turquoise ocean. Those who want to spend a romantic evening with their partner will find much to like about this restaurant. The traditional music is just the icing on the cake. Le Duc de Praslin is well-known by locals as a gourmet restaurant. Besides its great beach location and the artistic decoration, the delicious food here is the real star of the show. Enjoy an after dinner drink in the rooftop bar with its astounding view. This small restaurant includes a café and a beautiful view of Anse Volbert. It serves up delicious Creole cuisine at a fair price. The excellent Pirogue Restaurant and Bar is located on the Cote d'Or on Praslin, and its Creole cuisine and international delicacies are fantastic. From time to time, local bands perform live music here, which only adds to the atmosphere. Besides the delicious food, the restaurant's bar serve up delicious cocktails and wines. These two villas will exceed all expectations, having been carefully-decorated with close attention-to-detail and a smattering of different Creole elements. The villas offer lots of space, and round off their impressive package with an ocean view. Luxurious villa with three en-suite bedrooms with ocean view, three bathrooms, air-conditioning, fully-equipped kitchen, nespresso coffee machine, living area with satellite TV, free internet, safe, car, plunge pool, veranda with ocean view. Exclusive villa with four bedrooms with ocean view, four bathrooms, air-conditioning, two fully-equipped kitchens, nespresso coffee machine, living area with satellite TV, free internet, safe, iPod docking station, car, pool, kids pool, veranda with ocean view. Villa with magnificent 360° view, four spacious rooms with double beds, modern bathroom with both indoor and outdoor showers, double size bathtub, WC, air-conditioning, ceiling fan, telephone, radio,TV, free WiFi, minibar, hair dryer, safe, tea and coffee maker, private veranda with infinity pool and sundeck, balcony, jacuzzi, private fitness room, sea and mountain view. Babies and Children up to 17 yrs: 60 €. Adults: 60 € plus 100% on board. Please note that half board is mandatory from 23.12 - 07.01 (€50/adult and €25/child from 0-18 years old). In addition, a compulsory festive dinner supplement applies on 24, 25, 31.12 and 01.01 (€30/adult and €20/child). The Hillside Villa features two separate 2-Bedroom Apartments which can be booked individually, but ONLY for last-minute bookings. In this case, half the normal price will be charged. Please be aware that from 1st May 2018 until 1st February 2019, there are construction works taking place at the Le Duc de Praslin from 8am to 5 pm at the far northern end of the property, on the grounds of the standard rooms. The 360° Villa is available for stays as from 15.05.2019 only. 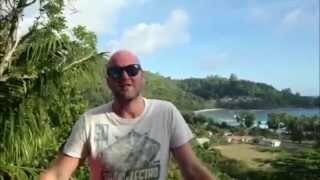 Booking for Villa "Le Duc de Praslin Hillside Villas"